I used to love frosty days when I was a kid because we could play on the way to school pretending to ice skate or breathe like a dragon. 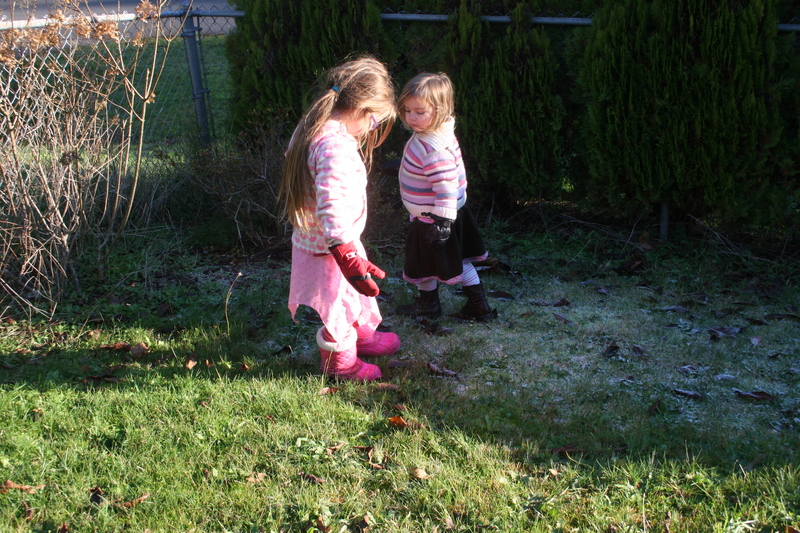 The same sense of wonder came over my girls when they looked out on a clear frosty morning. They dressed quickly and rushed outside to see if they could find ice . They found ice on top of the water table and in containers that we have on the deck. They soon learned that ice is very cold! Later in the morning the girls put on their gloves to go out on an ice hunt. Look there is water and a leaf is floating. The ice has edges, I think there is water underneath. I removed the lid from the water table. The girls were very excited to find ice inside there too. We added the penguins play set and a few whales. We made a slide for the penguins with some of the broken ice. When we got to the front of the house we found a small patch of frost. Why is it frosty here and not anywhere else? Because the sun made it melt. So, why didn’t this bit melt? It was in the shade. 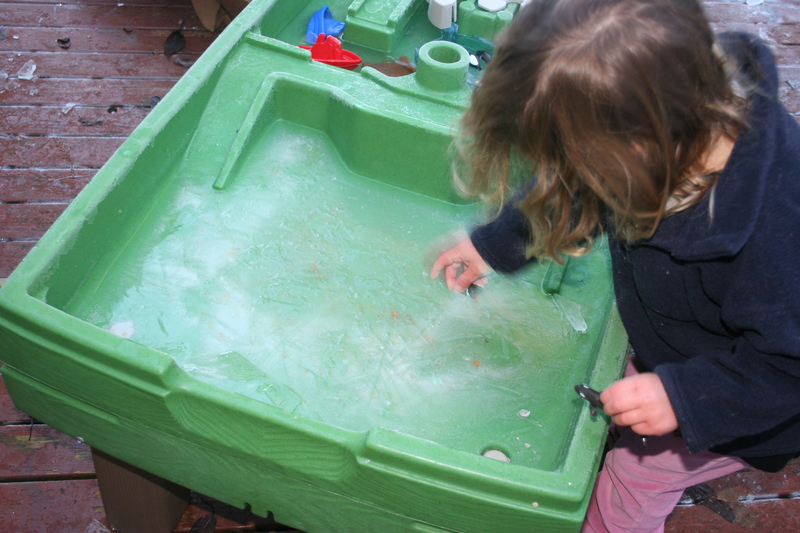 We decided to leave the lid off the water table to see if we could get even more ice the next day. When they woke up the next day the girls were desperate to get out before any of the ice had melted. First they checked the water table. The ice was thick and some of the penguins were buried underneath. Let’s see what else we can find. We went back to the water table where the girls found 2 scoops filled with ice. We can’t get it out. Shall I run it under the hot tap like I do with the ice lollies? Next the girls turned their attentions to the animals stuck in the water tray. Please can we get them out? Can we put hot water on them too? We poured water onto the ice to free the animals, they could feel the hot water making holes and as we poured more on they were able to free them. The other side of the water tray made a perfect ice rink for the penguins. I’m so glad we are home pre-schooling on days like this. Our next project is to make ice decorations for the tree at the front of the house and using pirate treasure maps they made earlier in the week, hunt for coins buried in the ice. My pirate obsessed girls will be armed with special pirate tools and a bit of magic sea salt. Arrrr. Previous PostChoir is Not for GeeksNext PostThanksgiving – A Festival to Say Thank You for Turkeys? Ice makes everything look pretty magical! Amazing how much they can learn just by exploring and playing. My little girl loves jumping in ice puddles to crack them! Such a fun learning experience for them both, I feel quite chilly seeing all that ice as it’s still very mild here in Cornwall. 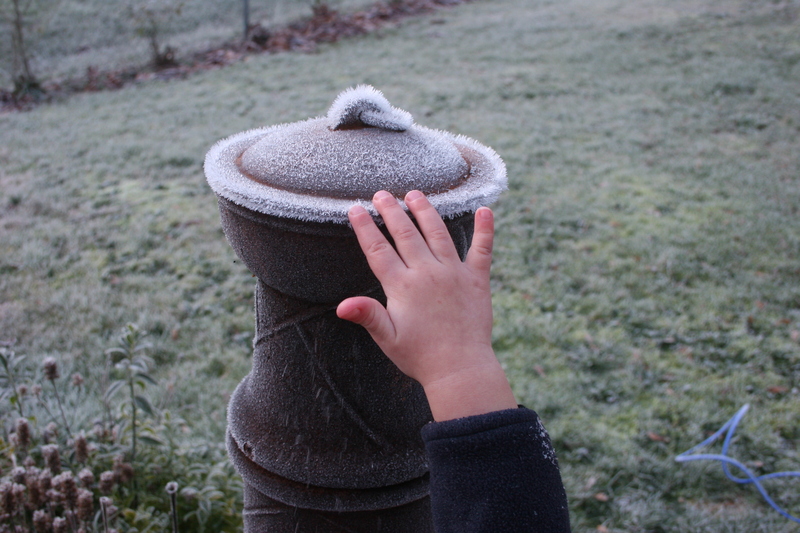 The play activities with ice are endless and you’ve shared some great ideas, thanks for linking up with Country Kids. I love all the education going on there. Sounds like they really have been enjoying the ice. Thanks everyone. This is a great ongoing project for the winter. Not only does it encourage the girls to play outside but also they are learning a lot about temperature and the properties of water. since we made the ice decorations it hasn’t been cold enough for them to solidify all the way through. Is this down to temperature or the position in which we placed them? I’m learning lots too. I love this Rachel. I love how you encourage and support their self-directed learning. They are learning so much – unstructured – and it’s lovely. Thank you so much for linking this post up with us at the homeschoollinkup! I hope you have a great Thanksgiving! We could do some serious ice discovery this morning. Sheesh! If only we could open the door. The snow is so high! Thanks for linking up with us again! Visit Rachel McClary's profile on Pinterest. Had Enough of Snow? These Peanuts Snow Sculptures will Make you Smile. Picture Books to Add to Your Valentine’s Day Collection.